Simultaneously delivers adjustable cold therapy and intermittent compression, making it easy for you to apply the two most difficult-to-manage aspects of the RICE (Rest, Ice,Compression and Elevation) regime. Portable and easy to use, Game Ready™ is an effective aid in the treatment of musculo-skeletal injury or post surgery where cold therapy and compression are indicated. The Game Ready™ System circulates cold water (via a connector hose) from the control unit’s ice reservoir to the patented anatomical wrap before returning through the ice reservoir. As a complete loop, the system delivers adjustable, circumferential cold therapy, continuously cooling and removing heat from the treatment site. 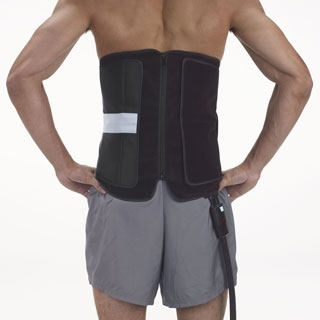 At the same time, the form fitting Dual-Action Wraps (based on NASA spacesuit technology), simultaneously delivers adjustable, circumferential, intermittent compression. Where elastic bandages, messy ice packs, and other alternatives offer limited adjustability, the Game Ready™ System allows you to easily adjust pressure, manage temperature, and select treatment time settings – with just the push of a few buttons and the twist of a dial. The system is used by individual patients and athletes from nearly every professional sport who now benefit from the Game Ready™, now you can too. To learn more about Game Ready™ and the science behind it, go to www.gameready.co.uk. As well as availability at our treatment centres in Parkstone and The West Hants Club, BWT have Game Ready™ units available for hire at home, a great advantage if you are recovering from surgery, enabling you to gain the best advantage from the Game Ready™ by applying daily treatment at regular intervals without travel difficulties. For information regarding treatment tarrifs and prices for rental systems, please contact us at BWT Physiotherapy by telephone-01202 749514 or 01202 514852 or email - info@bwtphysio.co.uk. NB: Game Ready™ does not use any chemicals, glycol, or refrigerant gas. Only ice & water required.